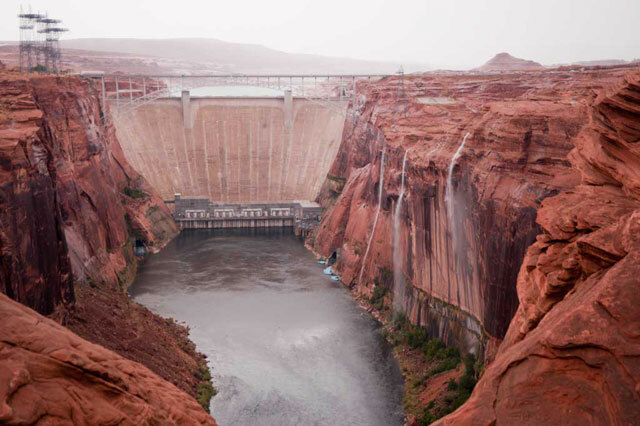 The latest (and potentially most daunting) impact of climate change in the Grand Canyon region is in the news: Lake Powell is, quite literally, circling the drain. For the first time since the construction of this hydroelectric marvel in the 1960s, the U.S. Bureau of Reclamation has announced that it will limit releases due to ongoing drought conditions in the lake’s watershed. The effects on agriculture, power creation, and recreation would be dramatic should the emergency continue and flows continue to decrease; not to mention a long list of issues in Grand Canyon resource management. This latest development has longtime dam critics saying “I told you so” and federal, state, and local planners wringing their hands. Follow these links for more information on the emergency restrictions and to a New York Times book review of a magnificent work by author Bill deBuys that frames the issue in a much larger context. Note: For some excellent information on the geology and future of Glen Canyon Dam and Lake Powell, visit renowned author and photographer Gary Ladd’s Lake Powell and Glen Canyon Geology pages.